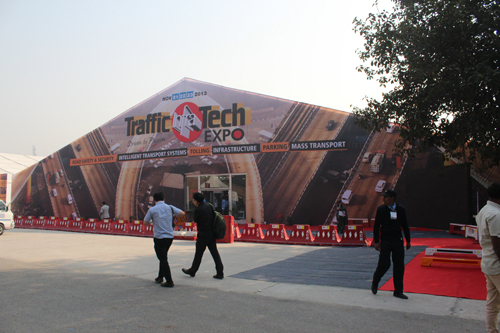 The third edition of TrafficInfraTech Expo, India?s premiere integrated, international 3-day Show on traffic opened to a grand welcome at the NSCI Exhibition Complex in New Delhi on Nov 21. The Show was inaugurated by Sudhir Krishna, Secretary, Union Ministry of Urban Development while D. Deepti Vilasa, Vice-Chairman, Delhi Development Authority, S. Gangopadhyay, Director, Central Road Research Institute and Munir Khan, Inspector General, Jammu and Kashmir were the guests of honour on the occasion. More than 80 companies from countries such as the USA, Germany, the UK, France, Italy, Spain and Australia are displaying about 120 brands of the latest innovative products and solutions. The Show covers all the verticals of the traffic industry such as traffic management, road safety, security, traffic infrastructure, intelligent transportation systems, tolling, parking and mass rapid transit. Sudhir Krishna congratulated the organizers of the Show and said that the products and systems displayed at the Show would definitely increase awareness in the industry, especially among the infrastructural companies, government agencies and other regulatory authorities about the latest, innovative solutions available in the country today for overcoming traffic problems and challenges. Safe commutation was essential for proper development and safe commutation had to be planned. 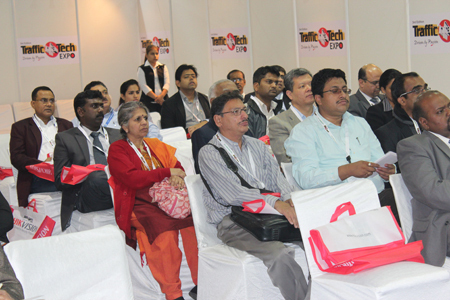 He said that the good news for the traffic industry was that the latest technologies as well as adequate resources were available to tackle the problems but what was lacking was an awareness of these technologies..
TrafficInfraTech Expo was uniquely positioned to serve this purpose, and has been doing so ever since the inception of the Show two years ago. 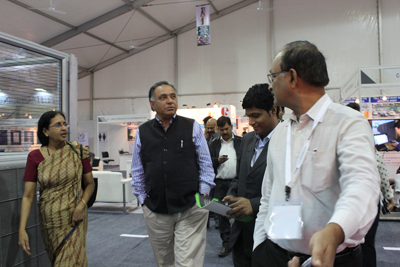 The chief guests were amazed at the latest technologies and products on display at the Show. They felt that they had not witnessed this level of integration and sophistication of technologies on display in any similar show, and in this sense this was truly an international show which integrated all the verticals of the traffic industry. Deepti Vilasa felt that the Show was a value enhancing effort by the organizers which targeted the niche area of traffic and brought about a crucial awareness of the problems faced by the traffic industry and the solutions being available. Gangopadhyay opined that such shows should be organized more often in cities apart from Mumbai and Delhi so that a wider section of the population would be benefitted. The first day of the seminar featured an interesting seminar on Parking Management which elicited a lot of queries from the seminar delegates. N. Satyanarayanan, Managing Director, Central Parking Services, speaking on the design aspects of off-road parking management systems gave insightful details about the design expectations, adequacy requirements, internal and external design aspects, parking geometrics and lighting aspects of parking management systems. Wilfred Menezes, CEO, Omnitec Group spoke on the technology aspects and covered parking guidance, parking management and technologies used such as RFID and Automatic Number Plate Recognition Systems. The afternoon session of the first day featured a panel discussion on, ? On Road Parking: Challenges, Management and Solutions?. The panel consisted of Taj Hassan, Special Commissioner of Police (Traffic), Delhi Police, Amit Garg, Additional Commissioner of Police (Traffic), Hyderabad Police, Bhure Lal, Former Chairman, FCI Chairman Pollution Prevention & Control Authority and Sandeep Channan, Egis Road Operation Ltd. Taj Hassan said that a good solution for parking problems could come from a good public transport system. Garg was of the opinion that irregularities in shop licensing were a major cause for on-road parking problems. Further, commercial and residential areas have been quite intermixed. Unauthorized on-street parking is a major problem, and to tackle this, public attitude towards parking and alighting while parking has to be changed. Channan said that introducing a system of booking advance parking spaces, already available in Western countries could help. The booking could be done either online or through applications on smart phones. G.S Bali, Minister for Food, Civil Supplies, Consumer Affairs, Transport and Technical Education, Himachal Pradesh and Amit Kumar Jain, Deputy General Manager (Train Operations), Delhi Metro Rail Corporation were two of the distinguished visitors to the Show in the afternoon. 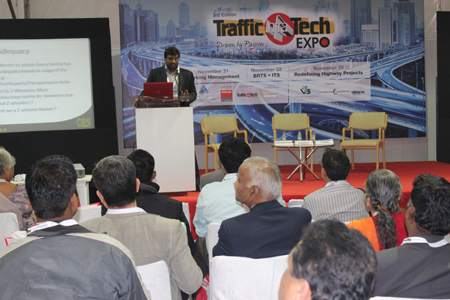 Bali said that an event like TrafficInfraTech Expo was a good initiative which creates awareness of the problems in the traffic industry among the system providers, police officials, infrastructure companies and government agencies. Jain said ?Parking systems and parking management equipment are two of the systems that are required these days. For a consumer such as DMRC, at TrafficInfraTech Expo we find all the companies, vendors and system providers under one roof which makes it easier to make contact with the right people. I was looking for a particular technology for DMRC and I was able to find the provider for this at the Show. ?